Weber vs. Char-Broil are two of the most popular bbq grill brands. 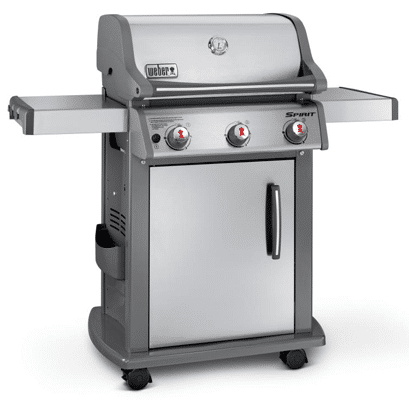 Consumers are choosing between these two grills in stores nationwide, but which is better? We will look at both companies, their features and prices and try to determine the better buy. Char-Broil is a privately owned subsidiary of the W.C. Bradley co. which was founded way back in 1885 in Columbus, Georgia. The W.C. Bradley Company was initially started as a cotton and textile manufacturer. In the 1920s Bradley realized the need to diversify so he purchased the Columbus Iron works. In 1949 the Iron Works manufactured its first cast iron barbecue grill. In 1973 production moved to a new plant in the Bradley industrial park and the name Char-Broil was given to their line of gas grills. Char-Broil Grills today are made in China. To be transparent, we have never sold Charbroil at Yale. I have owned one however. In 1952, George Stephen, a Weber employee cut a marine buoy in half, added some vent holes and legs and the Weber grill was started. His invention of dome shape grills with a cover to protect the food from the elements was an immediate success. Later in 1956 he redesigned the kettle grill for a more current design. George, the master griller, was continuously looking for ways to improve the kettle grill. In 1985, he added metal flavor bars to provide better heat distribution and control drippings which reduce flair ups. This method of cooking makes the grill easier to clean and gives it better heat distribution. This new design was the Weber Genesis grill which changed the design of gas grills forever. Weber is actually the least serviced brand at Yale including appliances. Equipped with Gear Trax™ for easy accessory mounting. Measures Approximately: 54.75" W x 22" D x 46.5" H.
Well, price is a factor as the Char-Broil is cheaper at $449 compared to $549 (we include free delivery and assembly for grills over $499). Char-Broil is also a hotter grill at 48,000 BTU vs 32,000 for the Weber. 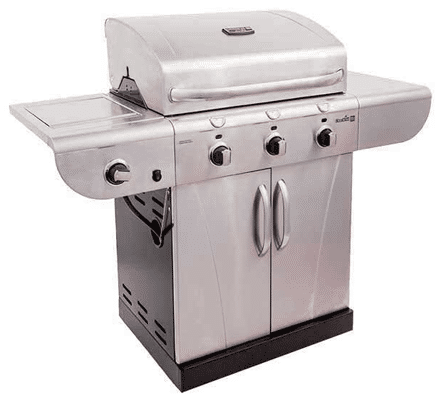 Most Char-Broil grills are made of type 430 stainless steel. This lower grade of stainless steel tends to rust in a few years, especially around the burner box. Weber grills are constructed of a higher grade of stainless steel and porcelain which holds up in all types of weather and heavy use. Weber is also easier to clean with channels that direct the excess grease into an aluminum tin located under the grill. The tin can be easily removed, thrown out and then replaced keeping your hands clean and free of grease. You need to lift off the grates and remove the grease manually from the burner box located under the burner in a Char-Broil. Overall construction includes the wheels. Charbroil is plastic, and Weber has weather resistant casters. I have personally owned both grills. I actually liked Char-Broil and it does technically have better specs. However, I recently bought another Weber because of the upgraded features it had to offer, mainly the higher BTU. My old Weber is 14 years old and is still being used by my neighbor. My first grill, a Char-Broil, lasted approximately 5 years. So it really depends on reliability versus price. Download the Yale BBQ Grill Buying Guide with features, specs, and inside tips to all the major brands. Well over 100,000 people have read a Yale Guide.